On-screen card games have always been a fan favorite, where telling someone to shuffle up and deal is replaced by a simple key press, mouse click or finger tap. As technology evolves and our devices become smaller and more portable, the complexity and overall quality of these games continues to improve. The following card games can be played while offline, allowing you to enjoy yourself even when stuck without an internet connection. Designed by casino industry pros, this app does not require an internet connection and does a great job simulating the true Baccarat vibe. Features like manual card shuffling, squeeze play and pattern detection supplement an eye-pleasing interface that is customizable. Does a good job of teaching the rules of what is not always an easy game to learn. There is no pattern board available, something most digital Baccarat players desire. With a casino feel and an impressive sampling of themes and settings, this version of mobile Blackjack adds some extra excitement to sliding your chips across the virtual felt. Most real-life blackjack strategy options are offered, including the ability to take insurance on a hand. The game even features Hi-Lo and KO strategies aimed at helping you learn to count cards. Real-time advice can be toggled off and on, depending on your comfort level, letting you gradually perfect your craft as time goes on. Settings are highly customizable, including the ability to choose up to eight decks if you wish. The house seems to have a distinct advantage, more so than you'd find in a physical Blackjack game. 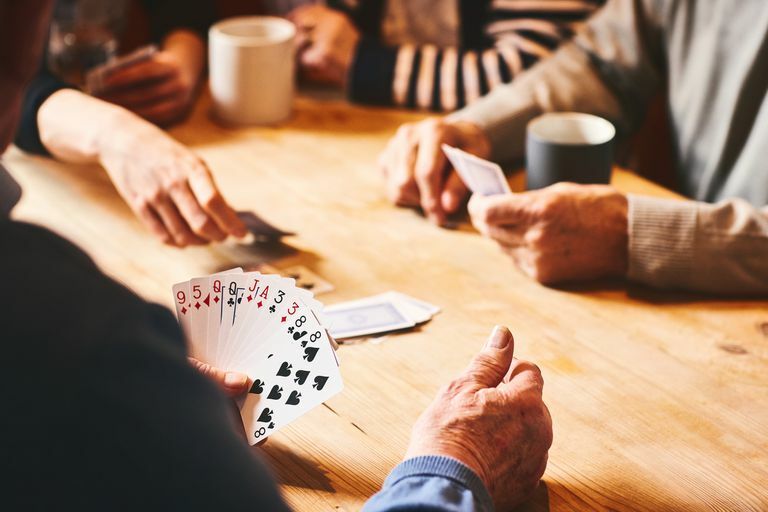 The race to 121 points is on, and Cribbage fans will enjoy this feature-packed app that offers a lot for offline players. Although the game really shines with its multiplayer tournaments, the single player without an internet connection is not left in the dark. With dozens of achievements available and varying levels of gameplay difficulty, Cribbage Pro's in-depth logic ensures that even the most advanced players will find themselves both challenged and rewarded. The app's shuffling engine utilizes random.org, eliminating any uncertainty about how arbitrary its card distribution actually is. In-game ad placement can be very distracting. A modern adaptation of a traditional title, this version of Gin Rummy features the expected basics along with an impressive set of modifiable settings including the option for separate melds as well as the ability to modify the width and curvature of your cards. There are also a few different deck styles to choose from, whose positioning can be easily shifted on your screen. An easy-to-follow rules section along with an in-game link to the Wikipedia entry for Gin Rummy ensure that even beginners will be able to master this game. A paid edition is available, which removes advertisements, keeps statistics and unlocks access to advanced difficulty levels. You can sort your hand by rank with just the tap of a button. A common complaint with several card game apps, the computer player's decision-making AI has significant room for improvement. Gin Rummy Royale presents a sharp look and feel that will really stand out on your Mac. Its game engine is better than most in its class, and you can choose from five different variations including Hollywood, Oklahoma, Straight and the always-entertaining Speed Gin. The app contains several themes and gradually increasing difficulty levels, along with a single player mode that can be played while offline. Higher levels are challenging and can get pretty intense. Pop-up ads are especially annoying when you consider the fact that you paid for the game. A fun game where a low score is good but hearts are not, this version of a playing cards classic is a great fit for PCs without an active internet connection. Pit your skills against virtual opponents right on your Windows desktop, all the while avoiding the dastardly Queen of Spades. The advertisements are not intrusive, unlike with many other free games on this platform. Typical Hearts strategy doesn't always apply here, as the computer-controlled players attempt to shoot the moon more often than a real person might. With a sharp, clean interface and the ability to choose between a standard game type where you play to 500 or Suicide Mode where one player from each team must bid nil with no blind nil in play, this version of Spades found in the Microsoft Store is fun and can be played without an internet connection. Both easy and hard levels are offered, with the ability to resume your previous game at any time. Despite noticeable flaws in logic (see below), it's still the best offline Spades option for Windows. Your virtual partner makes way too many questionable moves. Because of the sheer amount of cards that need to be displayed simultaneously, Spades apps are not always a comfortable fit for smaller screens. Spades+ gets it right, however, with crisp visuals and smooth gameplay perfect for your portable device. Although many of the app's touted features such as multiplayer matches and in-game chat require a live connection, you can get the full single-player Spades experience while offline. Spades+ has the perfect pace, fast but not overwhelming. The spades expertise of the computer AI in single-player games leaves a lot to be desired at times. This game was designed solely with offline play in mind, and the attention to detail for that specific type of gameplay really shows. Turn-based offline multiplayer contests are even offered, a feature non-existent in most competing apps. Hold 'em newbies can benefit from on-screen advice, while seasoned rounders will be pleasantly surprised at the toughness of their computerized opponents in the game's advanced levels. The compact and easy-to-use interface is suitable for smartphones. The virtual opponents win on the river card a bit too often, even at beginner difficulty settings. A derivative of Rummy, Tonk (or Tunk) is a criminally underrated card game that is just as fun when played in digital form. The app does a decent job of walking you through the rules, if needed, understanding that the majority of the population may not be familiar with the game's structure. Multiple versions including Knock and No Knock can be played, and daily rewards are even provided to offline players. Game sounds can be replaced with vibrations in place of just disabling them altogether. Interface does not support portrait mode.